Pink slips are what they used to call the “certificate of title” (proof of ownership) for cars in California—because they used to be pink. Why did Gihachi encourage his family to move to Utah at one point? Didn’t everyone have to go to camp? For about a month in early 1942, the government tried to get Japanese Americans to move on their own. They called this process “voluntary resettlement.” This was to see if they could get all Japanese Americans out of the exclusion area without having to do anything. In a time of fear and uncertainty, this was too much to ask of most people however, a few did. These were messages you could send immediately—sort of like old school emails! You would go to an office and tell the person there your message. They would relay that message to another office, and that office would deliver the printed-out version to the recipient. Starting in 1940, the US government started restricting how much of their own money Japanese immigrants could access. This was partly because the US had a trade embargo on Japan, and they wanted to prevent Japanese immigrants from sending money back to Japan. After Pearl Harbor, they froze Japanese immigrant bank accounts and other assets. 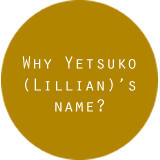 Gihachi probably wanted to put the car in Yetsuko Lillian’s name because she was a US citizen—in her name, they could sell the car, but if it stayed in his name, they may not have been able to. December 19, 1940, Letter from Gihachi to Tsugio, Lillian, and Angela; written in English. You will find the pink slip for Ford in a envelope on the side of my desk. Also I want to know whether you get pink slip for the Plymouth. February 25, 1941, Letter from Gihachi to Tsugio, translated from Japanese. If you can be evacuated with the car, since it has a big trunk you can pack it with things, and it would be a good idea to go to Salt Lake City. December 29, 1941, Letter from Gihachi to Tsugio, written in English. March 14, 1942, Letter from Gihachi to Tsugio, written in English. Hello: I have received your letter of Mar 4 and am glad to hear you are in receipt of my letter in Japanese. I was glad when I read Yukiko’s letter in which she said Mr. Hoffman may buy your hotel. You are lucky have man like him among your roomers. Hope you will learn more how to drive car, but be careful for yourself too. March 27, 1942, Letter from Gihachi to Tsugio, written in English. You buy more trunks and big boxes and try save more things and keep them Daishi church or place like that. If Mr. Hoffman will take care your place leave big things which you can pack them in the trunk or boxes. Be careful with driving automobile as you are not very good yet. If you have some body drive for you alright, otherwise you better not take it wherever you go. Hello: I am in receipt of 2-mamas and 2 Yukiko’s letters of April 30 and the picture of the car and family on May 2nd. I am very sorry to sell out the car but it can’t help this time. May 19, 1942, Letter from Gihachi to Tsugio, written in English. It is good you have sold the car in good price, also it is all right you left the bank account just as it was before if you can write and can draw money anytime you need. Though we lost lots money on our new car we are proud and happy that once we owend a new car. It make me happy every time I see the picture of new car & family on my desk. How it be joy and happy when will live together. 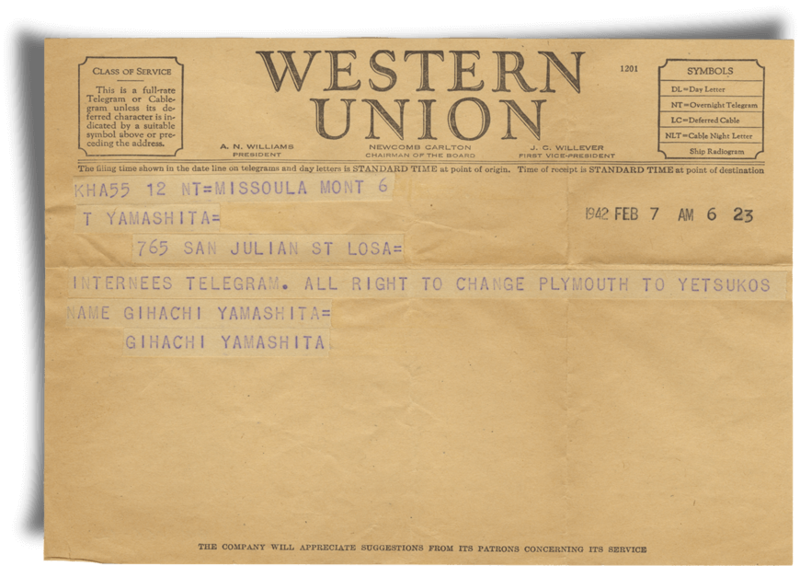 Telegram from Gihachi instructing Tsugio to change ownership of Plymouth car into daughter Yetsuko’s (aka Lillian) name. 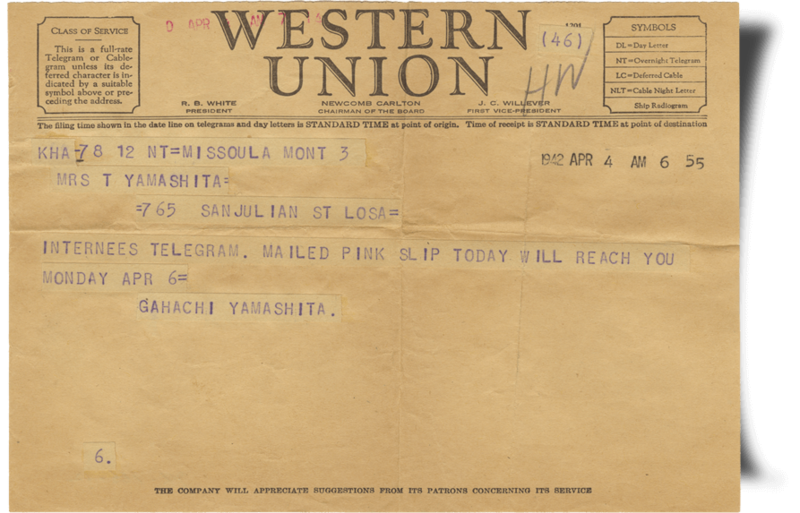 Telegram from Gihachi to Tsugio concerning the car’s pink slip, or title. 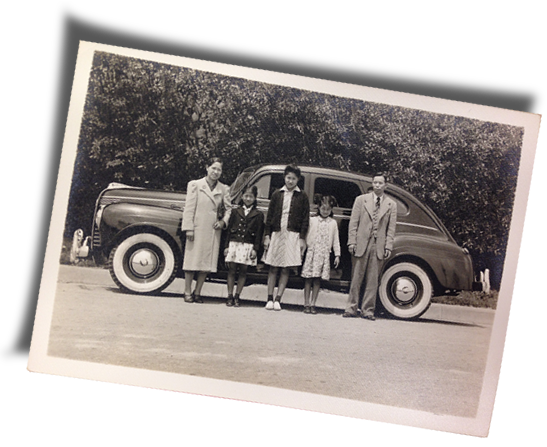 Tsugio, Angela, and Lillian, along with friends, pose in front of the family car.